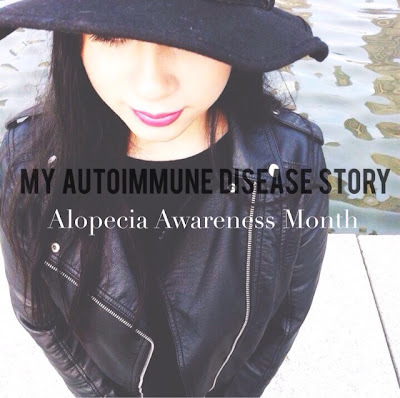 "Alopecia areata is a condition that causes a person's hair to fall out. It is an autoimmune disease; that is, the person's immune system attacks their own body. In this case, their hair follicles. When this happens, the person's hair begins to fall out, often in clumps the size and shape of a quarter. The extent of the hair loss varies; in some cases, it is only in a few spots. In others, the hair loss can be greater. On rare occasions, the person loses all of the hair on his or her head (alopecia areata totalis) or entire body (alopecia areata universalis)." - WEBMD. It's basically every girls worst nightmare, and I was living in it everyday. About 50% of the female population will experience some sort of hair loss or thinning by 60 years old, and out of those 50% around 20% happen to have alopecia. Now I happen to be one of the, dare I say, lucky ones? Because my alopecia was different, at 14 they told me my hair would not grow long after about a year or two and that by 5 years I would be bald. Well I am 21 and my hair grows crazy long at a rapid pace and I am not bald, God has shown me so much grace. On Instagram the other day I saw the hashtag #alopeciaawarence and I read all these amazing stories of these beautiful ladies and I thought wow y'all are so brave and I decided it was time to share my story. Frozen is an all time favourite of mine. And Elsa's motto of "conceal, don't feel, don't let them know" was my motto for 9 years of my life, until today. I concealed my hair loss and thinning with every updo known to man, hats and little tricks, I blocked any sort of feelings, and I most definitely never let anyone know. People never noticed because my hair is quite long it is easy to cover. I do get a couple of remarks like: "why do you put up your hair so much?" "I don't think I have ever seen your hair completely down before? Have I?" "Oh your hair is so thin and long!" I use to dread them, but not any more. I could easily say that I have felt God's love and support through this entire thing and that I have taken this with grace and strength but if I said that I would be lying. The last two years have been officially the hardest years of this process. It's also been the first two years of my life in which I have really encountered God, go figure. Last year, my hair was at an all time low, like nothing I have ever seen, I was so angry at God because I wanted to wake up the next morning and have my hair back. As the year past I saw nothing change. But this year, 2014, has been different, Theres been a dramatic change in my hair, it is getting thicker and stronger and it feels great. But this year, I was sad. All the years that I have been bottling my feelings up decided this would be the year it would explode. Alopecia not only attacks hair, it attacks self esteem and self confidence. I was in a dark pit that no one could help me out from. I thought God no longer cares and because of that I am no longer going to care too. I had my weeks were I was fine and happy and the whole world was amazing and in those happy times I decided to take pictures of my hair to see the progress of it (pretty cool actually in the long run) but then there were my very sad long days, weeks, and months. The worst week happened three weeks ago, the emotional pain transformed into a physical pain that I had never felt before, it HURT and it hurt real bad. If you know me you know I pride myself in my womanhood, my feminism, my strength and independence. But everyone has a weakness and mines happens to be an autoimmune disease. After that day I had a series of breakdowns and anxiety attacks that lead me to just giving up and surrendering it all to Jesus. I thought I had before but I really hadn't. There were many things I still held on to and me wanting to fix myself by my own strength was one of them. I allowed myself to finally feel and be completely broken because I was ready to allow God pick up my broken pieces and create a beautiful mosaic. My healing isn't going to be a "snap of the fingers" type of healing. It's been a 9 year journey, and my healing is going to be a process. A process that I am learning to love and to accept. We are not defined by hair, clothes or makeup, We are defined by who we are, who we inspire, who we help, who we love, and who we have compassion for. 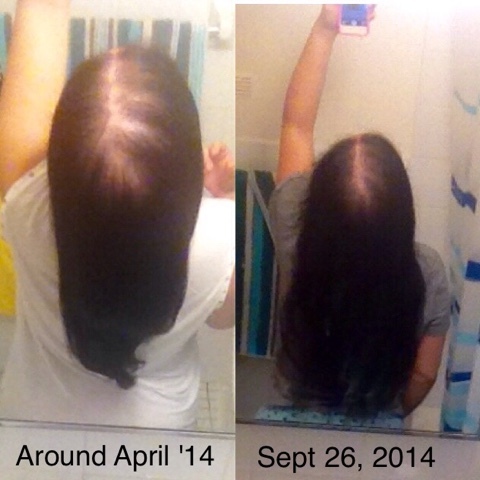 I lived off comparing my hair to others, but I stopped and learned to love my own thin strands that make me, well me. I hope that whatever you are struggling with right now makes you stronger, that you embrace everything that comes your way, good or bad. That you love without limits. That you have a heart full of gratitude in even the saddest of days. But you can't do it alone. Run to God, He is there, and it may not seem fair or right that you are going through this trial but know that all things work together for your good! And even if I go bald, or if I get a full set of hair back, I will love my God no matter what! He knows my path, and he knows yours. You just have to cling to him. Trust me life is so much better when you let go and simply let God be who He is suppose to be in your life. Besides God. I would like to thank my parents for being my solid rocks. Mom, from being there with me the day they told me I would be bald for life, and for the nights you held me saying everything was going to be alright. Dad, for taking a day off just to take me to the doctors because I felt sad. To Dylan, for the past three years you have seen my hair get to it's thinnest form to slowly getting thicker, I thank you for always saying "I love your hair" since the beginning. For holding me in the car like a baby and just cry with me and pray life into me, thank you for making me giggle till I forgot the hurt and for loving who I am and looking past my imperfections and accepting me, I am a lucky lady. And last, to Sandra, my mentor, my spiritual mother, one of my very best friends, thank you for crying with me and telling me how it is when I need it, for loving me from the day we met and letting me into your family like one of your own. Thank you guys for being the people I run to when my skies are grey and allowing me to see the rainbow. Even though I thought the day that I would share my story would be the day I was completely healed, God had a bigger plan and he is urging me to share my story to bring awareness on a disease that is often embarrassing, shameful and saddening. I love you all! Y'all are beautiful and worth everything this world has to offer!! Here's what we are all dying to see, a picture! I don't know if you see the difference but I do hehe, and it's still not there yet and I have a while to go but God is faithful and I'll continue updating on my blog about my journey! I hope this brought awareness to Alopecia and know that their are many suffers of this, both men and women!! Hello everyone! It's Diana coming back from a very long hiatus! I thought I should explain my absence, I'll be honest it's been a rough season for me, extremely rough. The inspired-O-meter was at an all time low, right along with many other things. God is slowly picking me back up and I'm totally allowing him to do all the work, which I normally don't (yes horrible I know) but this life is way to grand for me to be stuck in a rut and if you are stuck in rut like I was just think about life, seriously think about it and just feel in awe of your body and how it's functioning, how the Earth slowly moves and you don't feel a thing, and of everything you have which was given to you by God's grace and love. I hope you enjoy this little something I wrote, see you soon. It's September which means the season of autumn is here. I personally use to hate fall and winter, I'm a Floridian girl living in Canada so it was hard for me to let go of the endless summer love. But this year it has been different, I found myself craving the cold wind, the coziness of fall and winter and all the layers of clothes that come with it. As I was on a walk yesterday afternoon, I started thinking of nature and how awesome trees were and how they adapt to the seasons. In fall, they change colours from green to yellow, red and orange, and then when winter approaches they start shedding those leaves off until springs rolls around and they start growing right back up until summer where they stay nice and green until fall comes back. As I was walking, a lot of the trees around me were already yellow, red and orange and when I looked at my feet I could see that some had already started their shedding process. Trees know that winter is coming, so they have to let go of these leaves. It made me chuckle because in a way it relates to our lives. But before I go on to explaining that I want to share with y'all why trees loose their leaves. 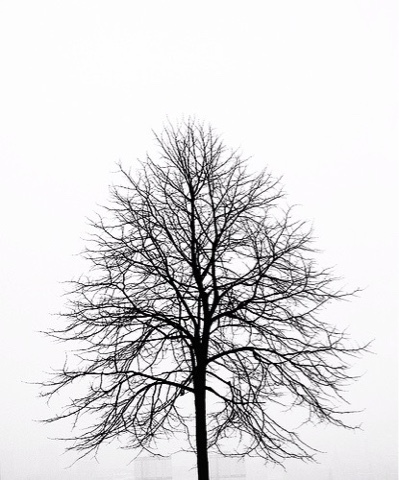 "When winter approaches, our part of Earth receives less sunlight, and the air grows colder. When these changes happen, trees prepare for winter. Trees that drop their leaves seal the spots where the leaves are attached. Then fluids cannot flow in and out of the leaves, which change color and fall off. The falling of the leaves does more than mark the season. It also helps the tree survive the cold, dry air of winter"
Conclusion, during fall trees close off the nutrients to the leaves which causes the leaves to change and fall to help the tree survive the winter it is about to face. We are going to have seasons of coldness and biter air and that's where God comes in and starts closing doors to certain things that will not allow you to survive what is happening around you, the change that you are going to embark on is magnificent that you can not be weighed down, not even by one single leave. Snow falls on trees all winter long, the tree does not fall, maybe a few branches snap here and there but it stands tall in its new robe of white. It is being transformed into a stronger tree for all the fruit it will bear but it must go through a process before it can blossom with beautiful green leaves; the winter process. The snow starts melting and the birds start chirping and one leaf starts to grow back. God starts opening everything he once had to close for your protection and it is now more beautiful than you ever expected. The colours are more vibrant and you realize that if it weren't for letting go of these leaves and being a naked winter tree, you wouldn't have had the chance to be the beautiful green summer tree you are now. Sometimes in life we need God to close doors and shake off things that will not allow you to survive the season you may be going through but know that just because these doors are being closed right now it does not mean that in the next season they won't reopen for your good and under His perfect will. So you may be standing on an open field, feeling vulnerable and naked but God is protecting you and He is soon going to clothe you but until then, do not be afraid to be a naked tree and catch the snow on your branches, yes it is cold and the air is biter but you are alive and soon you will blossom and understand what grace he has shown you. He has made both summer and winter. Are You In A Theory Or A Love Affair? 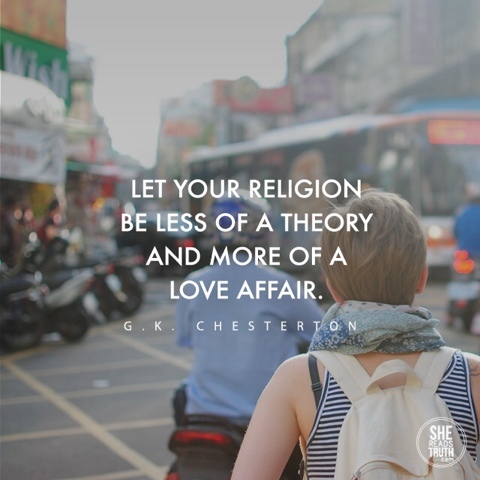 Today I saw a picture on the She Reads Truth app devotional which is the picture above with the saying "let your religion be less of a theory and more of a love affair". First off all, I haven't written in a while, so hello blogging world! I'll be honest with y'all I've been very uninspired to write, I've written a few things but I haven't been able to get myself to post them, why? Who knows! But anyways I saw this quote this morning and it was as if God himself gave me a nice slap in the face! A loving one of course. To often we make our Christian life a routine that we forget it's a beautiful love affair. A love affair with ups and downs, faults, struggles, weakness, and strengths. We also forget that there are others doing the same as us. I've seen many Christians bashing on other Christians for not being the perfect Christian that in theory every Christian should be. THEORY: a coherent group of tested general propositions, commonly regarded as correct, that can be used as principles of explanation and prediction for a class of phenomena. I'll choose love affair over theory any day. Living a life being in love with God and being on a whimsical love affair with Him is different than being in a theoretical relationship. I'll tell you why, theoretical relationship revolves around thinking too much and observing too much. To come up with a theory, you must research, observe, think and come up with conclusion to create a theory. When we are in that kind of relationship with God we question everything. We observe everyone around us, we think of all the wrong they may be going or even think off all the wrong we, ourselves, are doing. And we draw up conclusions of what we have observed. That's the gate way of being religious, we finger point the faults of others, we think we have ways of making everyone better, we start talking like Pharisees. Now a love affair relationship is very simple. I wrote a blog a while back called "Why I Am Dating A Black Man" and I wrote something that I'm going to bring into this, "Many say love is blind. I disagree. Love sees it all; the colour, the perfection, the imperfection, the weight, and the height but love decides to look past all that. Love sees it all and loves it with greater passion." Now that is a love affair. If you are in a love affair with God you are also in a love affair with His people. Simple as that. You love Jesus? Good, but remember; “I really only love God as much as the person I love the least.”- Dorothy Day. When you love, you forget about what the people aren't and you start looking at them for what they have. Like Jesus does to us. The judging stops and the love affair takes over. We start loving in a different way, an innocent way. You may even start to love the annoying things your brother/sister in Christ does. Instead of critiquing you may even crack a joke and enjoy yourself a bit more. Ive been in both of these relationships with God, lately I've been on the theory side, were I sit back and draw conclusions in my mind and think I'm right, I caught myself doing this and just started laughing at how absurd I was. As if my God needed a body guard. I stopped myself in my righteous tracks and here I am writing about how good it just feels to love. Maybe you've been to hard on others or even yourself, I don't know who this is for, but if your reading this just know it is easier to love than to not love. It takes more muscles to frown than to smile. Make this love affair count, be in love with Jesus and His creations. Don't be afraid to love, love doesn't run out; it's never wrong and never boastful. With Love & Grace- Diana C.
The girls behind the blog!